A number of individual awards contributed to Webster's top finish in the MAFA Championship. 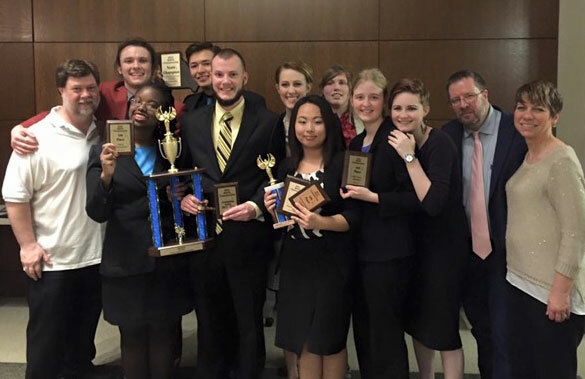 The Webster Forensics and Debate team hosted and competed in the 2016 Missouri Association of Forensic Activities (MAFA) Championship Tournament this past weekend. The young Webster squad earned a number of awards, including the Missouri State Champion plaque for President’s Division Overall Team Sweepstakes. The team has set a goal of placing in the top three in at least one team sweepstakes competition. A number of individual awards contributed to the team’s top finish. MacLain Naumann won two state championships, each in Prose Interpretation and After-Dinner Speaking. He added a second place finish in Dramatic Interpretation, which helped him earn third place in the Nona Dalan Pentathlon competition for the best individual event performer at the tournament. Geoff King was the second best speaker in novice parliamentary debate. Angela Meng placed in two events—third place and Top Novice in Prose Interpretation and fourth place in Extemporaneous Speaking. Kirby Weber won third place in After-Dinner Speaking, while Brianna Jones won fifth place in Poetry Interpretation. Earlier this spring, the team took home several awards in the Stateline Tournaments hosted by John Brown University and the University of Oklahoma. Webster School of Communications professor Scott Jensen, coach of the forensic and debate team, is also the current MAFA president and tournament director. During the weekend, he was presented with the association’s 2016 Distinguished Service Award. He is the longest serving director of forensics in Missouri, having attended his 29th state championship tournament this weekend. The weekend marked the first of three post-season tournaments for the team. They host a Nationals Warm-Up Retreat and their Annual Trivia Night this weekend in a final effort to get ready for the National Comprehensive Tournament, to be held March 16-20 at the University of Kentucky. Naumann will cap off the team’s travel season the first weekend of April when he represents Webster and competes in three events at the prestigious National Individual Event Tournament at the University of Florida. The team will also host a performance showcase later in April so the community can be an audience to some of the team’s award-winning performances.